Mixed results so far with this toy. They're still learning about the 2 drawers. They enjoy the sliding trays & finding a treat underneath. I'm enjoying the distraction it provides them so I can work in the kitchen without tripping over playing kitties. I'd buy this again. 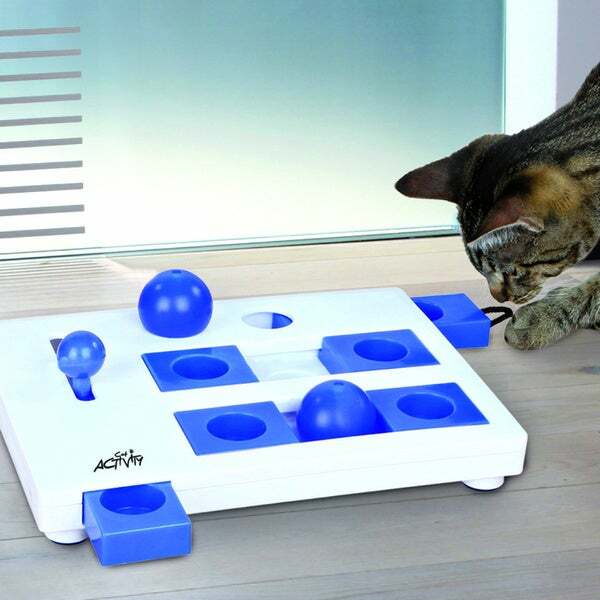 Channel your cat or dog's curiosity with TRIXIE's Brain Mover. Fourmodules, including pushing away balls, moving sliders, drawer knobsand loops, this game requires patience and concentration. This Trixie Brain Mover interactive pet toy is a safe andstimulating toy for a cat or dog of any age. It is constructed ofdishwasher-safe plastic, rubber and rope and features several smallcompartments and drawers. The toy also includes an instructionalbooklet that contains methods and tips to maximize a pet'sinteraction and enjoyment. My cat is interested in the toy, especially when it has treats. She hasn't figured it out yet, but she will. And she loves to play with the globes. The board is very well made, but she has big paws so she has to work to get the treats out, but it keeps her occupied. A new and interesting treat delivery system for or lazy cats! We have 3 cats ages 9 to 14. While generally still quite active, they get bored easily. We purchased this toy to help with this - and it does. What we have learned: follow they directions- there is a learning curve for the cats - it requires your participation - so far our big cats play best with it one at a time. They haven't mastered all of the game's moves yet but that's okay. Their not bored yet! I bought this for my "older" cat and she would not give it a second glance, but sent it to my friend who has a younger cat and she loved it!!! My cat spends many hours playing with this puzzle, lays beside waiting for refills. It is very durable and dishwasher safe! Everybody in my house thought I was crazy ordering this for our three cats, but all 3 of them have enjoyed finding the treats and catnip, I highly recommend this cat toy! This is really cool for my cat. He likes it! But it is supposed to be played together w you & cat- it’s not meant to be an alone activity for the cat. You have to train them how to use it using an incremental approach. It’s fun to watch my cat learn from me & then do it on his own. Beware you can end up giving them too many treats! Could be better, I think! I could not understand directions very well. How is my cat to understand them? There was only one ball included. Should have been two or more? MY 3 YEAR OLD AMERICAN SHORT HAIR LOVES THIS TOY! Blah. Maybe i can put some catnip on it to entice one of my four cats to be semi interested in it. Cats hated this thing. Not what I was hoping for. It took my two cats a few weeks to really warm up to this toy but it has literally become a nightly ritual for us to play with it. It is really fun to watch them work this over to get their treats. Of the 3 cats I have, only one is interested in this. I think my cat might like it; she is only 3, she's smart, and she gets bored while I'm at work. I'm hoping this will keep her amused. I'M HOPING IT WILL BE A CHALLENGING TOY FOR MY CAT.